Emmy Storms is a Dutch violinist born on December 22, 1988 (Perlman was 42 years old.) She began violin lessons at age five. She has been studying at the Royal School of Music in The Hague since age 8, where her principal teacher is Koosje van Haerlingen. In 2005, at age 16, she took first prize at the Davina van Wely Competition and in 2009 a third prize at the National Oskar Back Violin Competition, playing the Tchaikovsky violin concerto with the Orchestra of the Conservatory in The Hague. Many in attendance felt she deserved the first prize at that competition. Since 2006 she has taught at the Conservatory in The Hague. It is just a matter of time before she is discovered as a world-class talent, justifiably belonging in the top ranks of violinists – alongside Hilary Hahn, Leonidas Kavakos, Leila Josefowicz, Gil Shaham, Maxim Vengerov, and Pinchas Zukerman. 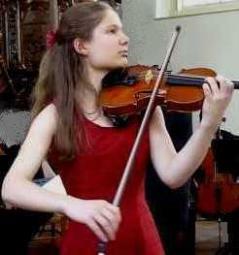 She is the youngest violinist profiled on this blog and she also bears an uncanny resemblance to Hilary Hahn.